TEGUCIGALPA, Jun 13 2012 (IPS) - Honduras, in the heart of Central America, normally makes headlines for its political upheavals and violence. But sometimes there is good news, too. It is one of only a few countries with a shark sanctuary off its coasts, and it has just created a protected area around a reef of a coral species formerly on the brink of extinction. This month Honduras is celebrating the first anniversary of the declaration of the Bi-Oceanic Shark Sanctuary that encompasses its entire exclusive economic zone, some 240,000 sq km spanning both the Pacific Ocean and the Caribbean Sea. Its coastal waters are home to numerous shark species, including hammerhead sharks, bull sharks, nurse sharks, tiger sharks and even six-gill sharks, which can reach lengths of almost five metres and are found in the Caribbean waters off Roatán, one of Honduras’ Bay Islands. “In the Gulf of Fonseca (on the Pacific) there are hammerhead sharks, one of the most endangered shark species due to the fact that their fins are highly sought after in Asia for making soup. 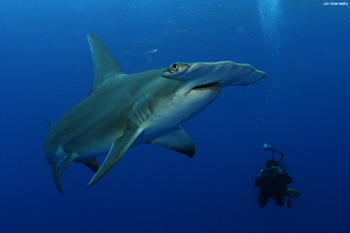 There are many young hammerhead sharks in the gulf, where they are protected,” biologist Stephen Box, who has studied the threats to these creatures in the Honduran sanctuary, told Tierramérica. Shark fin soup, considered a delicacy in China, can cost up to 750 dollars. Although the fins have no nutritional value, the soup is a culinary tradition that dates back to the Ming dynasty and became popular beginning in the 18th century among Chinese monarchs, who coveted it because of its rareness, experts told Tierramérica. Sharks are highly vulnerable animals. Although they have long life spans, they do not begin to reproduce until they are 18 years old and they have very few offspring, explained Box, who has lived in Honduras for almost a decade and works for the Centre for Marine Ecology, a Honduran NGO. A third of shark species are threatened or endangered around the world, said Maximiliano Bello of the Pew Environment Group, a conservation organisation based in Washington. These large predators act as controllers that maintain the balance of ecosystems, added Bello, the coordinator in Latin America of Pew’s Global Shark Conservation Campaign. “They are like the lions of the sea. If the sharks are not there, the system could collapse,” Bello told Tierramérica. Between May 31 and Jun. 2, Bello participated in a series of activities organised to celebrate the first anniversary of the shark sanctuary and the declaration of a protected area encompassing a bank of coral reefs off the Bay Islands. Together with Honduran President Porfirio Lobo, Bello witnessed the burning of 184 shark fins seized by the authorities from fishermen. In the waters of the sanctuary, the capture, sale and export of sharks are strictly prohibited. Natural Resources and Environment Minister Rigoberto Cuéllar told Tierramérica that the fact that sharks do not form part of the national diet has made it easier to protect them in Honduras. They are now working to educate fishing communities about the importance of sharks for maintaining the balance of ecosystems, he added. Alongside the Bahamas, the Maldives, the Marshall Islands, Palau and Tokelau, Honduras is one of the few countries in the world that have established sanctuaries to protect sharks. Now, the Honduran authorities have declared the Cordelia Coral Bank off the island of Roatán to be a protected area for wildlife preservation. The 17 sq km of reefs encompassed by the Cordelia Bank are home to the Caribbean’s most extensive living colonies of staghorn coral, a critically endangered species, marine biologist Calina Zepeda of The Nature Conservancy told Tierramérica. Aside from these recently discovered reefs in Honduras, staghorn coral has become almost extinct in the Caribbean, with its populations decimated by a rare disease between 1983 and 2000. In addition, the Cordelia Bank is an important spawning ground for various fish species, including the Nassau grouper (Epinephelus striatus), an endangered species. It is also home to a significant population of Caribbean reef sharks (Carcharhinus perezi), which draw tourists to the area for the practice of shark diving. In July 2011, another seven reefs were discovered in Tela Bay, on the country’s Atlantic coast. Six of them form the barrier reef of Capiro Bank, located 8 km out to sea from the city of Tela. The seventh, similar to Cordelia, is off the coast of nearby Punta Sal. The national and local authorities have decided to create a protected area to encompass all of them. For Zepeda, Honduras could serve as a sort of coral gene bank for the Mesoamerican Biological Corridor, an initiative jointly undertaken by eight countries – Belize, Costa Rica, El Salvador, Guatemala, Honduras, Mexico, Nicaragua and Panama – for the conservation and protection of the region’s immense biodiversity.